I realize the Gmail Tame Your Inbox with Priority Inbox campaign has been live for at least six months yet today I received a Beta invite in my Gmail account. After watching the video, it became clear to me that while Priority Inbox will serve their users as promised on one hand, on the other Google gets something out of too. 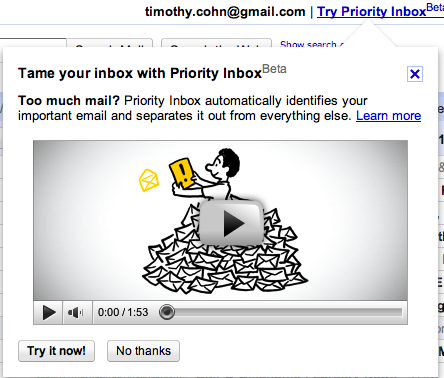 What pray tell does Google get out of mass adoption of its Priority Inbox service? An email usage algorithm guaranteed to more accurately deliver relevant ads to your Gmail Inbox. This entry was posted on February 3, 2011 at 12:26 pm and is filed under Gmail, Tame Your Inbox. You can follow any responses to this entry through the RSS 2.0 feed. You can leave a response, or trackback from your own site.